KUBINKA (Moscow Region), May 17. /TASS/. Almost 40 Russian aircraft and helicopters will fly to China to take part in the Aviadarts competition as part of the 3rd International Army Games on July 30 - August 9, Aerospace Force Tactical Aviation Combat Training Chief Major-General Oleg Makovetsky said on Wednesday. "The participation of 39 Russian aircraft of all aviation branches is planned. The aircraft will fly from the Knevichi aerodrome in the Primorye Territory to the Chinese Changchun airbase. August 5 and 6 will be the flight days," Makovetsky said during a meeting with foreign military attaches from 32 countries. Specifically, the competition will involve Russian Sukhoi Su-30SM, Su-35S fighter jets, Su-25BM and Su-25SM attack aircraft, Su-24M and Su-34 bombers, Su-24MR reconnaissance planes, Tupolev Tu-22M3 long-range bombers and Ilyushin Il-76MD transport aircraft. 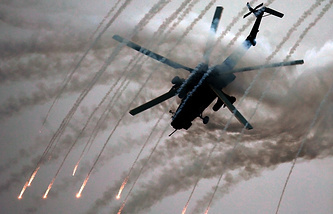 Russia’s army aviation will be represented by Mil Mi-8, Kamov Ka-52, Mi-28 and Mi-35 helicopters. "The competitions will be held in eight categories: two in army aviation, four in operational tactical aviation, one in long-range and one in military transport aviation. Russia aerobatic teams won’t participate in the competition. The Chinese groups will participate at the closing ceremony at the Changchun aerodrome," Makovetsky said. This year, Russian and Chinese pilots will use their aircraft to take part in the Aviadarts competition, he added. As was reported earlier, the Games will consist of 28 competitions for servicemen to demonstrate their field, air and maritime skills. Five new competitions have been added to the Games this year: "Military Rally" (a march of army cross-country vehicles to a distance of over 1,000 kilometers), "Drone Competition," "Commonwealth Warrior" (the professional military skills of CIS servicemen), "Guardian of Order" (the competition among military police units with obstacle overcoming), "Road Patrol" (the competition among military traffic police officers).